A journal of the joys gardens provide. It is often said that the fourth dimension is time. 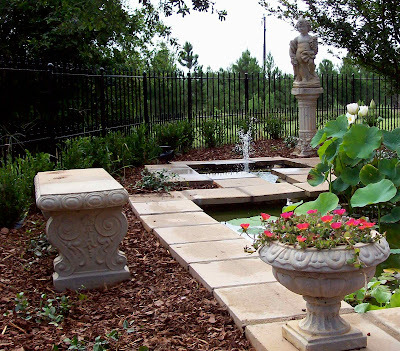 This fourth dimension becomes very important in garden design. Can you imagine if the garden was not affected by time? Plants might as well be plastic! Although it would be easier to design a garden, it wouldn't be near as much fun. Or challenging! Part of the excitement, joy, and even despair of creating a garden is due to time. It can be hard to imagine a 2 ft. plant growing to 20 ft. tall. Or a 4 in. plant eventually spreading to 4 ft. That's why the most common mistake is placing plantings too close together. A newly planted garden can look very sparse until the plants grow to a reasonable size. It can be frustrating to wait years for your dream to be realized, only to realize that it doesn't look like what you dreamed after all. After - with a little bit of time. Of course, in a garden, "After" is always changing. Time is part of the miracle of a garden. It's a lot cheaper to buy a small plant, take a cutting, or start a seed, than purchase a large specimen. And it's a lot easier to dig a smaller hole! In time, the plant will grow to its mature size. But, you have to be prepared to wait. And there's always time's influence, which may or may not be predictable. For example, on the west side of my garden, I planted three small trees. At first, this area of the garden was in full sun. But as the trees grew, the shade underneath them grew, too, until now that entire area is almost in full shade. It's a lot cooler on that side of the house - the main reason I planted the trees - but my plantings under those trees have continually had to change. And as I fill up that shady area, I am keeping an eye on another area, where a tree is dying. There is no way to say how much time it has left. But eventually, all those shade loving plants thriving under the spread of that large tree, will be in full sun. Those types of changes may take years. But every year, time changes the garden as it moves through the seasons. Just as it can be hard to imagine what the garden will look like in 5 or 10 years' time, even harder may be to imagine what it will look like from winter to spring, summer to fall. Just planting for fall and winter interest, spring bulbs, and summer blooms are not enough. 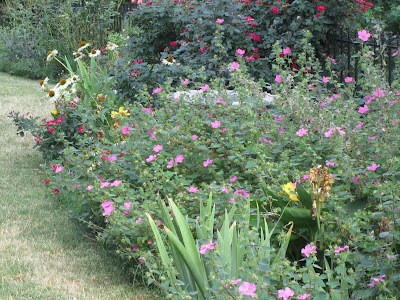 I imagine you want your garden's design to look good going through the seasonal transitions, too. No wonder we are always making changes to our gardens! It has taken time for the hedges to grow and the ground cover to fill in. Want to know a little design trick? Use a little photo technique that I have used in trying to decide which type of window treatment I want in my home. Take a photo. Place it inside clear plastic, and use a marker to make changes. This will help you imagine your garden in a few year's time. Mature trees can be drawn on top of newly planted ones. Shrubs can magically become full size. Even spring bulbs can be drawn in on a winter photo. I've only used this technique inside, but it might be fun to try it and see what my mature garden will eventually look like. Or, I can just take a chance and wait. After all, time will tell! I'm joining Donna at Garden Walk Garden Talk for Word 4 Wednesday meme on Time. Oh, that's a good idea. I should try doing this myself. If I had done this, I can bet some of my garden areas would look very different. I get so frustrated always having to wait until, "next year" to hopefully see my plans come through. And, I have so many different micro climates in my borders. What works on one end won't on the other. Some spots don't seem to want to grow anything well. I have a section of the border that looks beautiful every single year, no matter what I add. When I try to repeat it somewhere else, it's a no-go. Grrr! I always try to take pictures of each section of the garden all throughout the growing season so I can pull them up on "Paint" and formulate my plans for next year. It's fun! I can draw plants in and paint plants out. Now, that does sound like fun! It also sounds like it could get addicting! I might have to give this a try. It's always scarier to me to take plants out than put more in! You bring up a very good point about time in the garden. At another house years ago, I planted a vegetable garden and tended it for several years. There was a maple tree very close to the garden that was but a small thing when we built the veggie garden. Over time, it grew and shaded the veggie garden so much so we had to change our plans. That was a very small townhome yard, so there was not much I could do. I did not want to get rid of the only tree. However, these days I try to think of the eventual growth as I plan out the garden beds. I have a couple of very small trees near my vegetable garden. I've been wanting to cut them down, but our ground is so bad, we treasure any tree that will live! I know, though, that something is going to have to change eventually! Patient pants! haha You will be surprised how fast plants grow. Yours will be mature before you know it! I like your idea about time being a dimension in gardening, which is certainly true. I have planted trees and bushes too close to fences. Naughty and no excuse! My book and soap give away on my blog ends today, for anyone interested. What a lovely garden you have! It can be frustrating to have to wait, can't it? I think we gardeners get a lesson on patience more than any other lesson in the garden! The biggest change I have had in my garden is the pond garden. I thought it would be a very open water space but as the irises grew and spread around the pond and the cat tails spread and they weren't even planted by me it has become quite full. Eventually it will get shallower and will be more of the rain garden it was intended to be. Irises and cattails - it sounds beautiful, even if it isn't as you intended right now. And, as you say, time will change it, and maybe your vision will be realized. I've never heard about the 4th dimension. Gardening has taught me to be patient because good things come to those who wait. Principles of Design - sounds interesting. I will check them out. I find I can visualize what my garden will look like in a few years, but it's harder for me to visualize when the plants are fully mature in say, 10 years or so. Maybe I should work on that a little more. Very nice to see the images of your beautiful garden maturing over time. Time is very important in architecture as well as garden design, but for differing reasons. 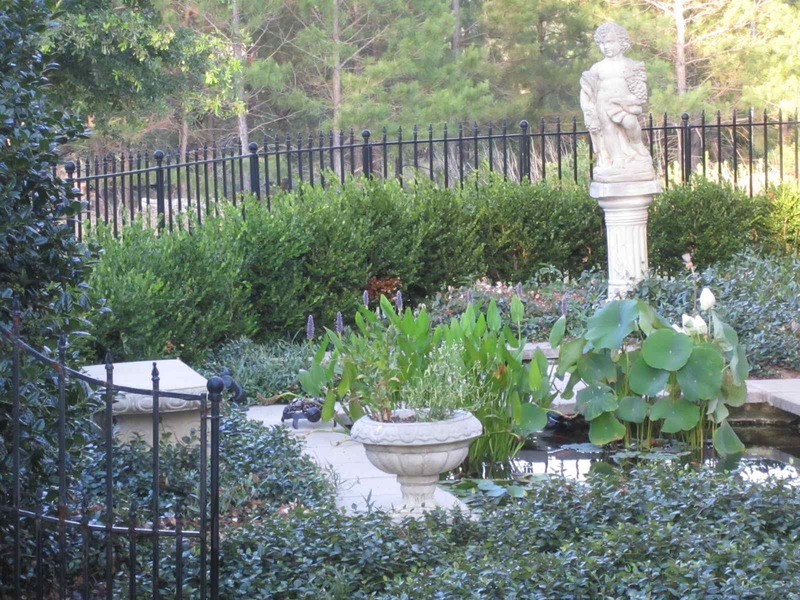 In garden design, working with living beings, there is less certainty or control. The same holds for buildings, but again differently. Weathering plays on materials and causes patinas, or decay. Time affects everything, with aging being the most noticeable. Gardens age, and how they age has much to do with those that created them, but also the seasons, the weather, the natural processes. Nice post. So true, Donna. Every garden will age differently because of the different variables. Soil composition, weather, companion plantings, rain and sunlight hours, even pruning, will all play a part. Interesting to think about. I know many people who have bought homes planted long ago by impatient gardeners and are now having to chain-saw huge hollies, planted to close to each other and the foundation. Tragic. Many years ago, I was one of those gardeners! Thank goodness for chain saws! I agree with you about starting with small plants. Part of the enjoyment is watching them mature. I never buy fully grown plants, After all, where's the fun in that ? I hate to spend the extra money if I know it'll grow to that next size in another year or so. Rarely will I purchase anything in a large pot because I hate to dig a hole that big! Interesting post Holley, about time in relation to gardening. I often say that Time is a luxury that most people take for granted which is my own take for the word. But time is great too, and it's interesting how the garden changes as we go through it. Thought provoking! I do love to see the garden changing. It's different every year! And I'm hoping my garden will become more beautiful as it matures. We'll have to see if that comes true! Timing and Weather and Yearly Growth all have alot to do with our gardens.... Every year is different from the years before... That's why Gardening never gets boring, does it?????? People don't realize what JOY they are missing when they don't garden. Just seeing those little sprouts pop up out of the ground is just awesome. Love it!!!!! So true, Betsy. Gardening is never boring - it's different every year, and from season to season! Well, actually, day to day! These are great before and after picks. It's amazing how the garden fills out as nature takes its course! Thanks for the good design tip too. It really is amazing, isn't it? I love to go back and look - I'm always amazed how fast plants grow! What a nice post. I'd love to know what you are using in that hedge and how long it took to go from picture one to picture two. I am not very patient, but I am slowly realizing I have no choice. The perennial garden was planted in late summer 2008; the pond garden was planted late summer of 2007. Both of the after photos are from this summer. The pond garden hedge is boxwoods - the ones in more sun have grown faster than ones that get mostly shade. They are just now beginning to even out. Thanks for asking - I had to go back and look up those dates. Your photos are lovely. You know I have full sun in my whole yard, some all day full sun too so it'd be kind of nice to have a shade location. I like your idea of using a photo in clear plastic and then marking it. That sounds so much easier than one technique I read about that said to take a picture of your garden from the roof of your house. Hubby was up on the top of the gazebo a few weeks ago pruning the wisteria and I almost asked him to take a picture of the yard while he was up there but I would have been pushing my luck! I "see" things better head-on, rather than like a blueprint, so from the roof wouldn't help me too much. Although, for most people it might be an easier way for them to visualize things. I suppose it all depends on how your brain works. I'm not climbing up on my roof for anything, though! I know about that pushing your luck thing. My husband wouldn't have been too happy if he was on top of something and I handed him a camera! Time travel - sometimes I wish I could travel ahead and see if my garden plans work out! :) I am happy for you getting to garden again soon. It will be so satisfying for you to get your hands in the dirt! Wow that is a lovely idea, i am sure many of us will try your trick too. 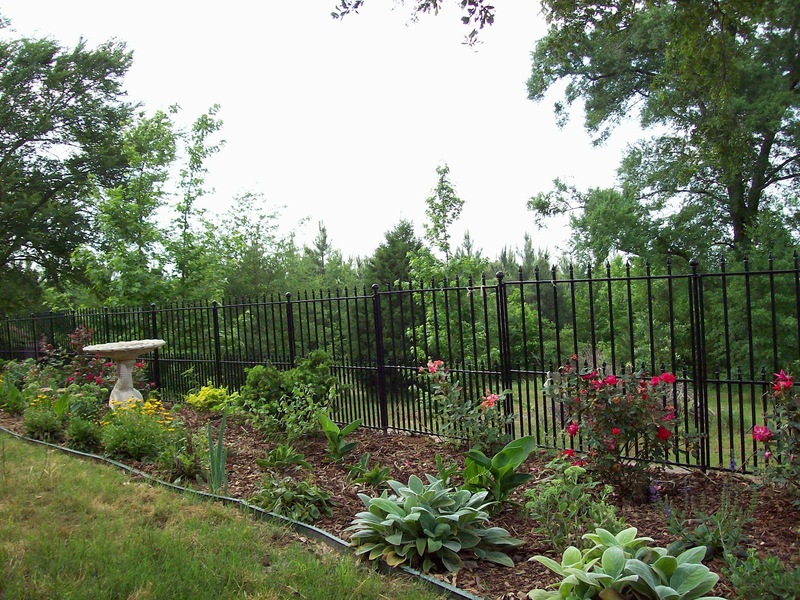 Your garden is so well maintained and beautifully showing off, all the TIME! Thanks, Andrea. It would be fun to try that little trick and save it, just to see in a few years how accurate a picture it made! I have to say even your 'before' photos are good! 'After' is never really 'after' in gardening, is it? Unless, I guess, it's the complete decline of a garden. But even then, some bulbs and plants will live on! Wonderful post - and I love the idea of putting the photo in clear plastic and drawing on it. I've never been good at drawing out garden plans on paper, but I might be able to use this trick! I'm not good at drawing out plan on paper, either. All that measuring never seem to work out for me! I loved this post about time as the 4th dimension, you made me reflect and that's quite an hard task for me! hahahahaha No, I am "low tech", so Photoshop and I probably wouldn't do well together! And yes, pretending we are patient is right! The garden teaches us patience time and time again, but it's a hard lesson to learn! I kind of like the mess and tangle, but mine is going to end up being a jungle soon. I start out fine when I first design something, but I seem to always try to keep squeezing plants in every year. I just can't seem to let it be! Love your trick! Thanks for sharing. And the after shots are just gorgeous. It is so rewarding to see the before and after! I am glad I actually took some "before" shots. It was fun to look back and see the changes. I like your perspective of Time as the 4th dimension! I've made the mistake of planting a bed with too many plants that look fine when they're still young. Had to pay the price - transplanted many of them when they were mature, and that was back-breaking work! I think we've all done that, but it would save a lot of work (and expense) if we could be patient and just wait for things to grow in. But it's a lot easier said than done! Holley, your garden is so lovely. Time is the element I always want to speed up so I can see that the garden will look in the future but it's also the element I need more of, and can never find enough of, to continue the growth of the garden. Thank you. I do enjoy my garden, but I think every gardener feels the same way. Plants Do The Strangest Things! A garden full of roses and companion plantings in Texas, zone 8. Like other gardeners, I am working to make my garden the paradise of my dreams. Copyright by Holleygarden. Travel theme. Powered by Blogger.